Are you a real estate professional and in need more leads for your pipe-line? Know you need to get into the social media marketing but don’t know where to start? Or do you have a Facebook Business that is not producing results? 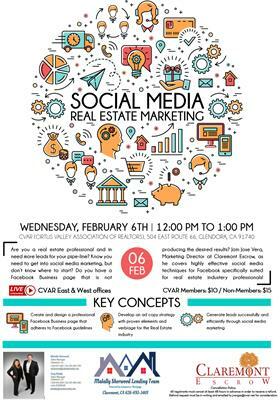 Join Jose Vera, with Claremont Escrow, as he covers highly effective social media creation and implementation techniques specifically for real estate professionals! This event is brought to you by the Malally Sherwood Lending Team NMLS 850455 NMLS 1084809 and the Citrus Valley Association of Realtors. - Develop an ad copy strategy with proven elements and verbiage for the real estate industry. All registrants must cancel at least 48 hours in advance in order to receive a refund. Refund request must be in writing and emailed to jvargas@cvar.net for consideration.